Our T-signs are cost effective signs for garden centers and nurseries. 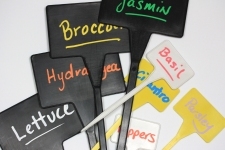 These molded plastic garden signs provide cost effective plant signs for multiple uses and feature a larger writing surface designed with angled tops for ease of readability. The white and yellow T-signs are easily marked with our Garden Pen (for permanent marking), while the black, yellow and white signs work great in combination with our Liquid Chalk (for re-marking). Browse these categories under "Plastic T-Signs"